Report an Invasive Species Sighting at 643pest.org! The Hawaii Invasive Species Council is an inter-departmental collaboration comprised of the Departments of Land & Natural Resources (DLNR), Agriculture (DOA), Health (DOH), Transportation (DOT), Business, Economic Development & Tourism (DBEDT), and the University of Hawaii (UH). The HISC was established in 2003 for the special purpose of providing policy level direction, coordination, and planning among state departments, federal agencies, and international and local initiatives for the control and eradication of harmful invasive species infestations throughout the State and for preventing the introduction of other invasive species that may be potentially harmful. 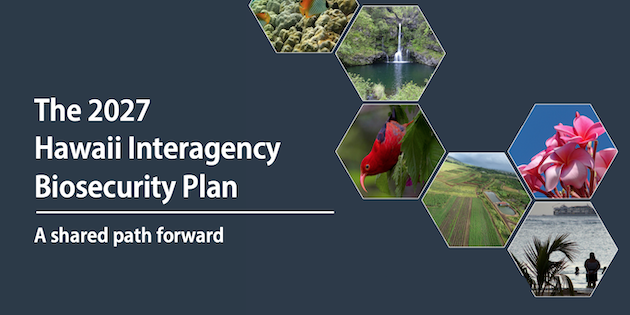 The HISC fulfills its mandate by issuing resolutions, providing plans, and strategically disbursing funds to enhance invasive species prevention, control, outreach, and research.